Extrusion in the manufacturing process can lead to laser welding wire losing hardness properties. 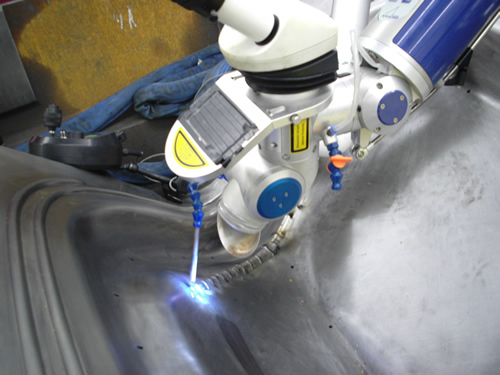 Laser welding has long been recognised as an excellent alternative to TIG and MIG arc welding. Through a tightly focussed beam with a diameter as small as two thousandths of an inch, heat input is minimised. With the precise control of the laser beam and the limited heat effects, welds are high strength, non-annealed and accurate with minimal deformity or shrinkage. Laser welding can be carried out on a wide range of materials – from stainless steel to aluminium, titanium to precious metals. Because the process is so controllable, scrap is minimised. The unique advantages of laser welding can be undermined if the properties of the filler material in the form of laser wire do not match that of the welded material. If the specified hardness of the laser wire is the same as the welded material, this problem should not occur. However, it has come to TLM’s attention that the extrusion process used by some wire manufacturers to convert thick wire into thinner diameters can result in loss of hardness. So though the original thick wire may have had a Rockwell Hardness measure of say 50, the thinner version, after extrusion, may in reality measure just 40. This unexpected drop in hardness may well escape the attention of manufacturer, supplier and, ultimately, the blameless end-user. In an industry such as Aerospace, if the weld is soft on a structural part of an aircraft it could have quite serious consequences. For an industry like the Tool and Die sector, the result may be simply time consuming and expensive with weld repairs turning out not to be quite as robust as they should be. TLM Laser supply laser welding wire from two highly reputable companies, Quada and Lawitex. Both are German-based and both guarantee the strengths of their laser welding wires so that you can be sure that the hardness specified is exactly the hardness your laser will work with.